Just a few years ago, no one thought Aspire would one day be a huge clearomizer brand it is today. It just emerged out of nowhere to be a leading brand but this wasn’t due to some magic. Over the years they’ve managed to give us some of the best clearomizers as well as glassomizers in the world. Take the Aspire Nautilus, for instance, it definitely has been a game changer mostly in the way vapers think of clearomizers. But before we could even recover from its grandness, they brought us its mini version, the Nautilus Mini. Far from it being just a smaller version of the Aspire Nautilus, it also packs a couple of upgrades and updates, like the new coil design which to date remains a leading design. At checkout, you will get a free bottle of e-liquid and on orders hitting $50 or upwards you’ll be given free shipping. Well, there’s still a lot more about this unit in our nautilus mini review that you wouldn’t want to miss on. So to read on to find out. In an effort to make it last longer, quality materials were used to develop this unit, right from the tanks (you have the option to pick either stainless steel or Pyrex glass) to its coils and overall structure. Add on the new coil technology plus the improved airflow control and that leaves you not only with top flavor and vapor quality but also an overall smooth vaping experience resulting from its great performance. The looks might not be that good but for its price, you definitely are paying for a superior quality product that won’t easily disappoint. As much as people relish how the unit’s tank is made, more people can’t have enough of its revolutionary replaceable coil popularly known as the Bottom Vertical Coil (BVC). So what’s good about this new coil technology and design? Well, other than getting your coils to last longer, it’s also the major reason why you are able to get not only wholesome but an unaltered cleaner taste from your e-liquids. Included with the Nautilus Mini is a 1.8 ohm BVC coil head. When using the coil head, the recommended setting to use is anything between 10 and 13 watts. With this design, you no longer need to be worried about wicks. Another great thing is that this newly designed coils can work exceptionally well with the original Aspire Nautilus, which means that if you wish for a larger tank yet you want to retain the BVC coils, all you have to do is just switch out the two. For those who don’t own the original Aspire Nautilus, well, count yourself lucky because if you buy the current version, it comes already equipped with these newly designed BVC coils. Please watch the video below to learn how to clean your BVC coils. Earlier on in our Aspire Nautilus Mini tank review, we saw that you have the option to choose between a Pyrex glass tank and a stainless steel tank for your clearomizer. 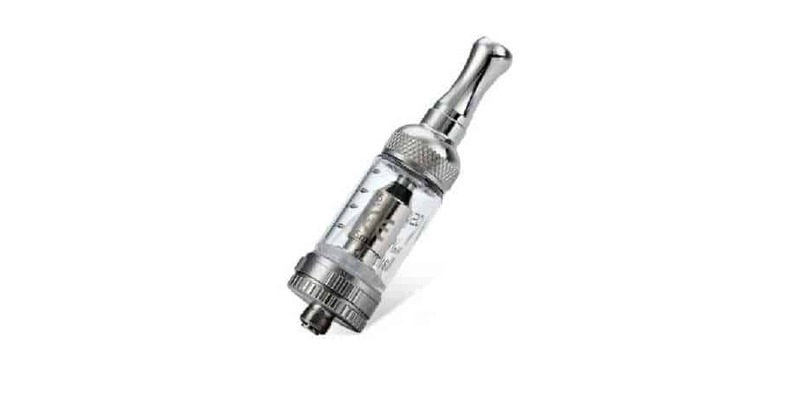 None is really better than the other but they are both better than the typical plastic clearomizer tanks. These two can last you for a reasonably long time because they are made out of quality materials. The tank can hold up to 2ml of e-juice, which is pretty much enough to last you a day. Filling is done from the bottom side. One great thing about the tank’s design is that it packs just enough space to fit your e-liquid bottleneck and so you will have no difficulties getting that e-juice right into the center hole. If you are new to vaping, this should be good news to you. Aspire equipped the Nautilus Mini with four different flow air settings. With these settings, you’ll have no difficulties finding that perfect draw. And on top of that, you’ll be able to adjust the warmth of the vapor plus the quantity of vapor produced and this you do by means of a valve ring that you only have to rotate. When you select a hole, the device clicks to notify you of your selection. So for the beginner vaper, tweaking around with this unit to find that perfect draw will be a smooth experience. Included with the Aspire Mini Nautilus is a comfortable standard round drip tip. If it turns out that you don’t like, you have the option to switch it with any 510 drip tip. This compatibility is actually plus for the unit. Not forgetting to mention that it also features a small silicon rubber ring that helps to seal it so as to avoid any leakages. Clearly, much effort was put to make the Aspire Nautilus Mini solid. Just like other Aspire tanks, its tanks (both the stainless steel and Pyrex glass) will certainly last you longer, thanks to the superior quality materials used to make them. In fact, you need not worry that your tank will crack if you use extremely potent liquids. Even the coils are strong and can last for a reasonable amount of your time before needing a replacement. What’s surprisingly good about this unit is that it only utilizes a single coil yet delivers extremely good flavor and a lot of vapor. Just as we mentioned earlier in our Aspire Nautilus Mini review, the new coil is one of its kind. No other replaceable coil boasts such a functionality. Other than the fact that the wicking material is outside the coil, air directly flows through the coil without any obstruction. The flavor may not be up there with that of RDA’s, RTA’s or Sub Ohm optimizers but when it comes to mouth-to-lung vaping, it’s almost second to none. Performance for this unit mainly stems from its BVC coils, a step-up of the BDC coils. For those who know about BDC coils, their performance is actually great but try to imagine of a better version with extended life and clean unaltered taste. Well, that’s what BVC coils special. So when you take this coil and add to the unit’s four different air flow control settings, you are going to end up with an extremely smooth vaping experience. What’s more, you can go ahead and chain vape on this unit and I can guarantee you are not going to get any dry hits. You can as well scale up the watts without worrying that your juice is going to be scorched until it starts to taste awful. Be sure to keep the wattage between the recommended 10-13 watts if you want a great experience. One important aspect of every purchase is figuring out whether you are really getting value for your money. So when it comes to the Aspire Nautilus Mini, bear in mind that you are paying for a quality product packed with cutting-edge technologies and features. Even though it might cost you anywhere between $25-$30 dollars, the Aspire Nautilus Mini is well worth the price. Nearly every Aspire Nautilus Mini review agrees that Aspire could have done better with this device’s appearance. Right from the brand logo which would have looked better anywhere else but just not on the tank to the not so good looking silicone seal at its bottom. More effort could have been put to give it a decent look and design anyway. At just 2ml, the tank’s capacity may not be ideal, particularly for chain vapers. Unlike its Aspire Nautilus which had a 5ml capacity, this small capacity of the mini version takes away a portion of its grandness. If you don’t apply much care when handling this tank, you are likely going to end up with broken pieces. Of course it’s study but not sturdy enough to face off with a drop on the floor and still remain intact. From our Nautilus Mini review, it’s clear that Aspire simply took simply plucked out all the great features of the Aspire Nautilus, polished some of them and then repacked the results into this little beast called Aspire Nautilus Mini. However, Aspire should have done better a little better with the design and appearance. But generally, the unit really tries to impress on all fronts from performance to vapor and flavor quality to build quality and value and with all that, it really makes for a solid buy.